CRUFTS – NEC …7th – 10th March 2019 (Hall 3, 47)……..CELEBRATING 20 YEARS OF CRUFTS !!! 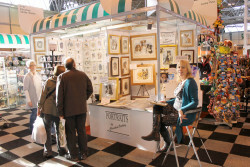 CELEBRATING 20 YEARS OF EXHIBITING at CRUFTS…!!! 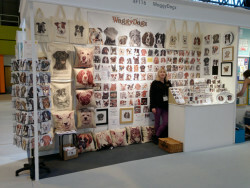 WaggyDogz will be exhibiting at Crufts, NEC 2019 once again on the Christine Varley Studio stand. Join us as we mark this event with free gifts and show offers. WaggyDogz cards & gifts are much appreciated by this dog loving audience. With new breeds and new products being added to the range, each year there is always something new to look forward to !! Original paintings on display, so bring your photos for portraits, for show offers and meet the artist ! Exciting news here at WaggyDogz … We are pleased to announce Spring Fair is the launch of our Guide Dogs charity Greetings Cards !! Guide Dogs funding is totally reliant on donations for the continuation of their amazing life-changing work. All WaggyDogz cards will display the logo, with a donation from the sale of each card in support of this worthwhile charity. Also this year, we celebrate our fifth year of trading with even more designs in our catalogue. The new section, ‘Equine’ offers choices for our horse loving customers. There are new cats as well as even more additions to our ever popular dog breeds. “Our beautiful brown Lurcher Dog, ‘Charlie’, loves the new WaggyDogz puppy designs launched this February at Spring Fair 2017!” These new and ‘oh-so-cute’ designs for greetings cards, cushions and tote bags will soon be rolled out across other ranges. WaggyDogz, in collaboration with Evans of Lichfield, have experienced huge success over the past 2 years with cushions and other textile products featuring popular dog breed illustrations. WaggyDogz artist, Christine Varley celebrates 30 years of painting this year! Established in 1987 as a professional animal and Pet Portrait Artist, Christine’s original paintings, with their layers of detailed watercolours, have been sent all over the world. The launch of these new puppy designs is a fine celebration! Christine works from her garden studio with her dogs at her feet, creating her beautiful masterpieces. “Its all in the eyes…this is the secret to great portrait !” says Christine, who understands the special relationship between owners and their pets. Clients say “You have captured the very character of the dog, like it will jump right out of the picture!” The WaggyDogz greetings card designs have been chosen for their appealing eyes, a real winner with customers who love to browse a spinner of cards for their favourite breeds. WaggyDogz brand with its quirky logo was launched in 2013. “I wanted to take my paintings to a wider audience.” explains Christine “The name was an inspiration from our springer spaniel dog ‘Molly’ whose tail does not stop wagging! She features in the range as design number 140 and is one of our best sellers. The range has been expanding steadily over the past 4 years since its launch and has gone from strength to strength.” Due to this on going success, a new larger Christine Varley Studio building has been constructed to accommodate the growing business. As well as greetings cards and cushions, the range includes key rings, mugs, clocks, coasters, chalkboards, tea towels, tote bags and canvas art. New potential licensing ideas are always welcome. WaggyDogz is a made in Britain brand, using small family run companies to produce their products. “We are passionate about supporting British industry with the manufacture of our products, which can be a challenge in the broader market place with tight profit margins.” At this fourth appearance at Spring Fair another new product will be launched, Bone China mugs produced and distributed on license by UK based EastWest Ltd.
UK and USA MARKETS SUCCESS for WAGGYDOGZ CARDS & GIFTSIts…”All in the eyes” here at WaggyDogz with our expressive dog breed designs. Preparations are underway for our 3rd appearance at the NEC Spring Fair 2016. Since our launch in 2013, the WaggyDogz range is continuing to grow. All our products feature the highly detailed paintings by pet portrait artist Christine Varley. The Dogs Trust Charity greetings cards continue to sell well, alongside the keyrings, mugs, coasters and tote bags.